Get ready for a career that reaches new heights. 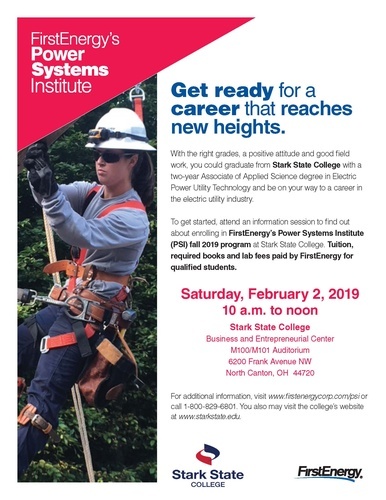 work, you could graduate from Stark State College with a two-year Associate of Applied Science degree in Electric Power Utility Technology and be on your way to a career in the electric utility industry. 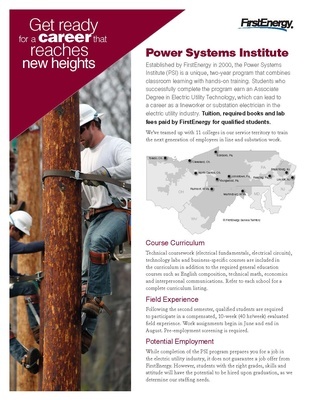 To get started, attend an information session to find out about enrolling in FirstEnergy’s Power Systems Institute (PSI) fall 2019 program at Stark State College. Tuition, required books and lab fees paid by FirstEnergy for qualified students. For additional information, visit www.firstenergycorp.com/psi or call 1-800-829-6801. You also may visit the college?s website at www.starkstate.edu. 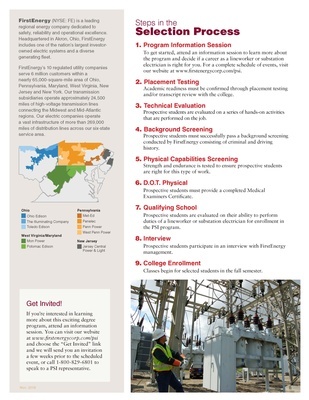 For additional information, visit www.firstenergycorp.com/psi or call 1-800-829-6801. You also may visit the college’s website at www.starkstate.edu.